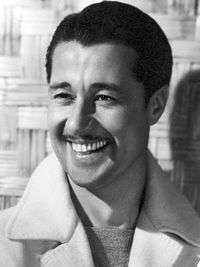 Don Ameche (born Dominic Felix Amici; /əˈmiːtʃi/; May 31, 1908 – December 6, 1993) was an American actor and voice artist. After touring in vaudeville, he featured in many biographical films, including The Story of Alexander Graham Bell (1939). He continued to appear on Broadway, as well as on radio and TV, where he was host and commentator for International Showtime, covering circus and ice-shows all over Europe. Ameche was married to his wife Honore for 54 years, and they had six children. Ameche won the Academy Award for Best Supporting Actor for his performance in Cocoon (1985). Ameche was born Dominic Felix Amici in Kenosha, Wisconsin on May 31, 1908. His father, Felice Amici, was a bartender from Italy from Montemonaco, Ascoli Piceno, Marche. His mother, Barbara Etta Hertel, was of Scottish, Irish, and German ancestry. He had three brothers, Umberto (Bert), James (Jim Ameche), and Louis, and four sisters, Elizabeth, Catherine, Mary and Anna. Ameche attended Marquette University, Loras College, and the University of Wisconsin, where his cousin Alan Ameche played football and won the Heisman Trophy in 1954. Ameche had intended to study law, but he found theatricals more interesting and decided on a stage career. From 1946 to 1949, Ameche, with other Los Angeles entertainment figures including Bing Crosby and Bob Hope, was a co-owner of the Los Angeles Dons of the All-America Football Conference, a rival to the National Football League. He was instrumental in forming and leading the ownership group the year before play began and initially served as team president. Ameche was married to Honore Prendergast from 1932 until her death in 1986. They had six children. One, Ron Ameche, owned a restaurant, "Ameche's Pumpernickel" in Coralville, Iowa. He had two daughters, Connie and Bonnie. Ameche's younger brother, Jim Ameche, was also a well-known actor. His brother Bert was an architect who worked for the U.S. Navy in Port Hueneme, California, and then the U.S. Postal Service in Los Angeles, California. 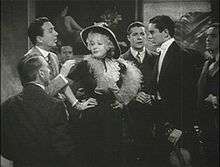 Ameche had done well in college dramatics at Marquette University, and when a lead actor for a stock company production of Excess Baggage did not turn up, a friend persuaded him to stand in for the missing actor. He enjoyed the experience and got a juvenile lead in Jerry For Short in New York, followed by a tour in vaudeville with Texas Guinan until she dropped him from the act, dismissing him as "too stiff". He made his film debut in 1935, and by the late 1930s, had established himself as a major actor in Hollywood. He appeared in such films as Alexander's Ragtime Band (1938), and as the title character in The Story of Alexander Graham Bell (1939). It led to the use of the word, "ameche", as slang for telephone in common catchphrases, as noted by Mike Kilen in the Iowa City Gazette (December 8, 1993): "The film prompted a generation to call people to the telephone with the phrase: 'You're wanted on the Ameche.'" In the 1940 film Go West, Groucho Marx proclaims, "Telephone? This is 1870, Don Ameche hasn't invented the telephone yet". While in the 1941 film Ball of Fire, Barbara Stanwyck's character discusses the "ameche" slang usage, "Do you know what this means: I'll get you on the Ameche." Another highlight was co-starring with Gene Tierney in Ernst Lubitsch's Heaven Can Wait in 1943, a film nominated for the Academy Award for Best Picture. In 1940, he was voted the 21st-most-popular star in Hollywood. In 1944 he reportedly earned $247,677 for 1943, making him the second highest earner at 20th Century Fox after Spyros Skouras. 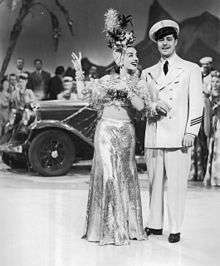 Ameche played so many roles based on real people that on one of his radio broadcasts, Fred Allen joked, "Pretty soon, Don Ameche will be playing Don Ameche." Soon afterwards, in It's in the Bag! (1945), which starred Allen, Ameche indeed played himself in a bit part. Ameche and fellow veteran actor Ralph Bellamy were eventually cast in John Landis' Trading Places in 1983, playing rich brothers intent on ruining an innocent man for the sake of a one-dollar bet. In an interview some years later on Larry King Live, co-star Jamie Lee Curtis said that Ameche, a proper old-school actor, went to everyone on the set ahead of time to apologize when he was called to start cursing in the film. The film's success and their comedic performances brought them both back into the Hollywood limelight. Ameche's next role, in Cocoon (1985), won him an Academy Award for Best Supporting Actor. He continued working for the rest of his life, including in the sequel, Cocoon: The Return. He earned good reviews for the David Mamet and Shel Silverstein-penned Things Change; the New York Times said that he showed "...the kind of great comic aplomb that wins actors awards for other than sentimental reasons." In 1990, Ameche appeared in an episode of The Golden Girls as Rose Nylund's father. His last films were Homeward Bound: The Incredible Journey (1993) and Corrina, Corrina (1994), completed only days before his death. Ameche was a major radio entertainer, heard on such shows as Empire Builders, The First Nighter Program, Family Theater, and the Betty and Bob soap opera. Following his appearances as announcer and sketch participant on The Edgar Bergen/Charlie McCarthy Show, he achieved memorable success during the late 1940s playing opposite Frances Langford in The Bickersons, the Philip Rapp radio comedy series about a combative married couple. It began on NBC in 1946, moving to CBS the following year. He also had his own program, The Old Gold Don Ameche Show, on NBC Red in the early 1940s. He also enjoyed a substantial Broadway career, with roles in Silk Stockings, Goldilocks, Holiday for Lovers, Henry, Sweet Henry, and Our Town. Ameche's best-known television role came between 1961 and 1965, when he traveled throughout Europe with a television videotape unit and camera crew to cover a different European resident circus or ice show that was taped for presentation on a weekly series titled International Showtime on NBC television. Ameche was present at each circus or ice show taped for the series, and was seen as host and commentator. His "anchor position" was in the grandstands at the particular show being taped. Sometimes, when one of the star acts of a particular show spoke English, Ameche would interview him or her and the interview would appear during the program. He also guest featured in many television series, including NBC's The Polly Bergen Show and ABC's The Pat Boone Chevy Showroom and Jack Palance's circus drama, The Greatest Show on Earth, which was broadcast during the 1963–1964 season. In the latter 1960s and early 1970s, Ameche directed the NBC television sitcom Julia, featuring Diahann Carroll. He was also a frequent panelist on the 1950s version of To Tell The Truth. After the release of two 1970 comedies The Boatniks and Suppose They Gave a War and Nobody Came, Ameche was absent from theatrical movies for the next 13 years. His only appearance in cinema during that time was in F For Fake, Orson Welles' documentary on hoaxes, when 20th Century-Fox mistakenly sent Welles newsreel footage of Ameche misidentified as footage of Howard Hughes. Ameche also appeared in an early episode of Columbo entitled "Suitable For Framing" (1971). Despite his advancing age, Ameche remained busy. He had credited roles in a feature film every year for the last decade of his life except 1986 (although he starred in the TV movie A Masterpiece of Murder with Bob Hope that year) and attributed his continued productivity to an active lifestyle, which included regular six-mile walks. He said in a 1988 interview, "How many actors in their 20s and 30s do you know that have two pictures being released by major studios in one year?" (referring to Cocoon and Things Change). In 1960, for his contribution to radio, Ameche received a star on the Hollywood Walk of Fame at 6313 Hollywood Boulevard and a second star at 6101 Hollywood Boulevard for his television work. 1938 Josette David Brassard Jr.
Jack Haley (left), Alice Faye (center), Don Ameche and Tyrone Power (right) in a trailer for Alexander's Ragtime Band. In Season 7, episode 12 of The Simpsons, "Team Homer", Haing S. Ngor's Best Supporting Actor Oscar, for his role in the movie The Killing Fields, had appeared with Ngor's name being crossed out and replaced with Homer's name. About a month after “Team Homer” aired in 1996, Ngor was murdered just outside his home in Los Angeles. 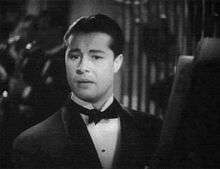 Animators changed the Oscar in question to that of Don Ameche in subsequent reruns. Don Ameche was also the Inspiration for Carter Pewterschmidt from the animation sitcom Family Guy. ↑ "Ameche, Don". Who Was Who in America, 1993–1996, vol. 11. New Providence, N.J.: Marquis Who's Who. 1996. p. 5. ISBN 0-8379-0225-8. ↑ Heise, Kenan (1993-12-08). 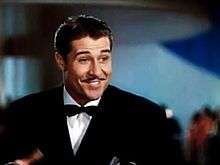 "Oscar-winning Actor Don Ameche, 85". Chicago Tribune. Retrieved 2010-11-07. ↑ Flint, Peter B. (1993-12-08). "Don Ameche Is Dead at 85; Oscar Winner for 'Cocoon'". The New York Times. Retrieved 2010-11-07. ↑ Flint, Peter B. (1993-12-08). "Don Ameche Is Dead at 85; Oscar Winner for 'Cocoon'". The New York Times. ↑ "Ancestry.com". content.ancestry.com. Retrieved 2010-03-23. ↑ Ian Herbert, ed. (1981). "AMECHE, Don". Who's Who in the Theatre. 1. Gale Research Company. p. 15. ISSN 0083-9833. ↑ Crowe, Jerry (2006-09-13). "The Dons of L.A. Pro Sports". Los Angeles Times. Retrieved 2011-09-08. ↑ "AAFC Chronology" (PDF). Professional Football Researchers Association. Retrieved 2011-09-08. ↑ "The Coffin Corner Vol. 25 No. 6: Welcome To L.A." (PDF). Professional Football Researchers Association. Retrieved 2011-09-08. ↑ Palmer, R. Barton. Don Ameche in Thomas, Nicholas ed. International Dictionary of Films and Filmmakers, Vol. 3: Actors and Actresses, Detroit: St. James Press, 1992. p. 9. ↑ Kilen, Mike. "Ameche's son in Iowa City recalls dad's legacy of joy". Iowa City Gazette. 8 December 1993. ↑ "FILM WORLD.". The West Australian. Perth: National Library of Australia. 14 February 1941. p. 16. Retrieved 24 April 2012. ↑ "Don Ameche's $246,677". Weekly Variety. 5 July 1944. p. 3. ↑ Canby, Vincent. Things Change (1988)October 21, 1988 Review/Film; Mamet's Unwiseguys", New York Times movie review. ↑ "Don Ameche (1908–1993) – Find a Grave Memorial". Findagrave.com. Retrieved 2010-03-23. ↑ "Coming to America Full Cast and Crew". Internet Movie Database. ↑ "5 Best Cameos in Film History". What Culture Ltd.
↑ Tara Aquino (16 April 2016). "10 Royal Facts About 'Coming to America'". New York City: Mental Floss, Inc.
↑ "Those Were the Days". Nostalgia Digest. 37 (1): 32. Winter 2011. Ohmart, Ben (2007). Don Ameche: The Kenosha Comeback Kid. Albany: BearManor Media. ISBN 1-59393-045-3. Wikimedia Commons has media related to Don Ameche.